In the traditional Roman Rite this is the feast of St Michael the Archangel. In the Book of Common Prayer it's St Michael and All Angels. The Novus Ordo compromised - more than St Michael but less than All: the Feast of St Michael, St Gabriel, and St Raphael. 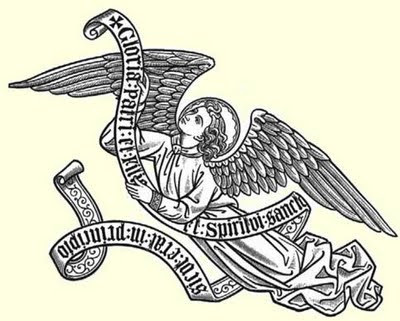 O Everlasting God, Who hast ordained and constituted the services of Angels and men in a wonderful order; Mercifully grant that, as Thy holy Angels always do Thee service in heaven, so, by Thy appointment, they may succour and defend us on earth; through Jesus Christ our Lord. Amen. That's today's collect according to the old BCP. It's the same in the Roman Rite and in the Latin of the Novus Ordo. Even the ICEL stayed pretty close to the ranch on this one. Down the centuries, until outboard motors, fishermen dipped sails three times in salute to MacDara's island off the Connemara coast. Now they sign themselves with the Cross. September 28 is given as the main feast day of the saint, but July 16 is the special day of local fishermen whose currachs still carry a small bottle of holy water in the prow. It is a day of reverent pilgrimage with the celebrant of the Mass bringing the Blessed Sacrament to the island in a special currach. 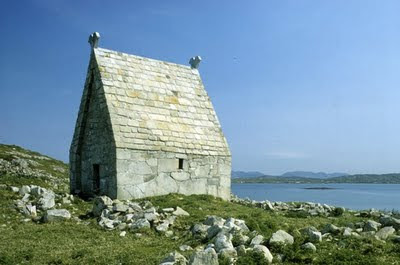 Marking MacDara's monastic settlement today are the famous remains of the little almost roofless ancient oratory built of massive stone. A wooden statue of the saint was preserved there for many centuries. 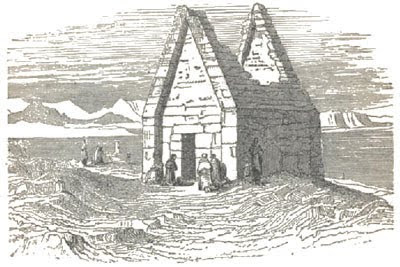 Fifth-century MacDara's name Sinach is met with again in 12th century Irish religious history. Ceallach of the Clann Sinach brought his "great name and influence" to the cause of renewal in the Irish church. Long a favorite name locally, MacDara is recently coming into greater use. It is interesting to note that Patrick Pearse, the poet-patriot of modern Ireland, chose MacDara as the name of his hero in The Singer, his classic play of Irish patriotism. To play for the service yesterday, I had to skip the 1:00 p.m. traditional Mass and attend the only other available traditional Mass, the one at 7:00 a.m. Except I overslept. So it was the Pauline Rite for me yesterday. Penetenze Age! as the demented old heretic in Name of the Rose always says. And if I were in any doubt that my penance was relevant to the, uh, "crime", there was that offertory hymn. The words were changed to something suitably religious sounding, but the tune was. . . .
. . . .The Skye Boat Song. I played for a funeral service yesterday, committing someone's ashes to the sea. I had a wonderful time. Which doesn't seem quite right. But I can't help it; I really enjoyed it. I got out of this miserable, blisteringly hot, dry corner of the world with its filthy air out onto the sea in the fresh, cool air for a couple of hours. I went for a boat ride, breathed the invigorating air, played pipes (the pipes loved the humidity), and got paid. What's not to like? And, yet. . . well, it was a funeral. A very sad occasion for the family. So I didn't smile. But inside and between you and me, it was a delightful afternoon. See, you get off your airplane at San Francisco International Airport and you're overcome with guilt at all the carbon you emitted what with riding on the airplane and all. I mean, the airplane emitted it. You may or may not have. But it's the aircraft that burned through oceans of jet fuel. And you, careless of the planet again, have facilitated it by riding on the airplane. What to do? San Francisco International Airport officialdom have just the solution: kiosks. You slide your credit card into one of these kiosks and buy yourself some carbon offsets. This seems to be entirely serious. Reuters publishes the solemn press release in all its sententious glory here. Bernie Madoff chose the wrong racket entirely. Rudeness When Addressing the Congress. . .
. . . isn't a brand new phenomenon. Of course, maybe that sort of carry on is only rude when addressed to The Sainted One. It doesn't count when the president in question is George W. Bush. . . .comes on a Sunday this month. Something had to go wrong so I overslept and missed the traditional Mass. So Novus Ordo it was. With piano. Tinkling piano mood music for everyone who misses the cocktail lounges of the '50s. I am, alas, not one of those people. Carefully, carefully. . . . The brand new pc has been cured of its user-inflicted maladies and is humming along as it ought to. The tech did a wonderful job of putting it back to its original out-of-the-box order. And I have carefully and oh so judiciously loaded the proper programmes of the correct type and in the correct order followed after careful examination by the files salvaged from the old pc. No more dumping all sort of odds and ends that might be useful if I knew what they were into the new box. The only thing left to get is the file of my old emails. I can't find where Eudora stores them and then transferring them so that they will be readable on the new pc presents a separate problem. Always assuming I can catch the old pc in one of its friendlier moods when the old video card and mother board decide to work. I suppose there's no hope of retrieving my old address book on Eudora short of copying it out by hand. All of which means that if I owe you an email your chances of getting it are considerably reduced unless I have your address from another source. A reminder to The_Inn at verizon dot com would be useful in that regard. The World Waits: Did the Fed-Ex Guy Ever Arrive? And delivered all the appropriate paraphernalia. I set it up and it all worked as it ought. Then I started tinkering with it. At which point things started to go pear shaped. Which is why this is being typed on Herself's little notebook PC with the tiny keyboard. The tech will be out tomorrow morning to undo my handiwork. The new PC is supposed to be delivered today. They don't give you a time of day; just a date. Somebody needs to be home to accept delivery. Somebody is me. So I am puttering around the house waiting for the Fed-Ex guy. At the moment I am, as you can see, blogging. On the old machine. Now that we have laid out the big bucks for a new machine the old one has decided to taunt me by working flawlessly. At least the assorted other odds and ends - monitor, keyboard, and so forth - don't have to be replaced. Small mercies. It is once again hotter than the hinges of hell today. And we are still surrounded by fires. Miles away, thank God. No danger at all here. But we can see and occasionally smell the smoke. (Here's what it would look like if you were a NASA satellite.) And this little office where The Inn is typed - the hub of the blogging universe - is still not air-conditioned. Maybe someday after we have it re-wired. I believe electricity was something of an after thought in this neighbourhood. Our contractor appears to have believed it to be a passing fad. This is the sort of idle rambling that kills a blog's readership. So they tell me. I suppose I should be more careful about that.